Dr. Fozdar is the primary neuropsychiatrist with Triangle Forensic Neuropsychiatry, PLLC, Raleigh, NC; Consulting Assistant Professor of Psychiatry, Duke University Medical Center, Durham, NC; and Adjunct Associate Professor of Psychiatry, Campbell University Osteopathic School of Medicine, Lillington, NC. The comments by two greats of science capture the essence of this editorial. The first quotation calls for scientific curiosity and inclusion. The second professes healthy skepticism and humility. The exponential growth of neuroscience discoveries fueled primarily by rapid advances in technology has lifted the veil on many hitherto poorly understood brain disorders. This knowledge applies to both organic brain disorders and, unfortunately misnamed, functional brain disorders. Collectively, we have failed to capitalize on this new knowledge at several levels as practitioners of forensic psychiatry, and this is the paradox discussed herein. We have failed to inform legal policy makers of these newly gained insights into brain disorders. By this failure, we are missing an opportunity to construct an evidence-based forensic practice. Eagleman and Flores3 argue this point eloquently by proposing a neurocompatibility index for developing modern criminal jurisprudence. Newer brain-imaging techniques, such as functional magnetic resonance imaging (fMRI), positron emission tomography (PET) scans, neuroreceptor mapping, and diffusion tensor imaging (DTI) have enhanced our understanding of the brain–behavior relationship. The field of cognitive neuropsychology has contributed significantly to this revolution by providing us an objective roadmap of cognitive networks. Despite these advances, expert testimonies are increasingly disparate when presented with the same set of data in a particular case. This lack of cohesiveness leads to confusion and mistrust among the triers of fact. Contradictions must be eliminated by collaborative efforts of different disciplines. Doing so will undoubtedly result in evidence-based criminal and civil forensic practice by reducing the role of intuition and sociopolitical forces. We can integrate well-established scientific principles at different levels of the judicial process: trial proceedings, sentencing guidelines, parole hearings, future risk determination, disability guidelines, personal injury cases, competency hearings, and juvenile adjudication. On the other hand, the application of neuroscience to the law must not be so overzealous as to raise concerns about scientific reliability, misapplication, and overreliance on a developing science. The following discussion is my earnest attempt to make a case for thoughtful incorporation of neurobiology into our forensic practice. I will discuss the areas of neuroscience where there is more chaos in this relationship than there is harmony. Convicted murderer Edward Rulloff was executed in 1871. Scientists acquired his brain to study the neurobiological underpinnings of criminal behavior.4 More than a century later, a PET scan was allowed into evidence during the murder trial of Herbert Weinstein in New York City.5 Although the actual evidence was never heard in the court, because the trial ended in a plea bargain, much has been written about the trial in general and Judge Carruthers' decision to allow the defense to use the PET scan evidence in particular. It is important to note that the judge did not allow the defense to establish any causal relationship between the PET scan abnormality (frontal lobe hypometabolism) and the criminal act (first-degree murder). There has been a steep increase in the number of legal proceedings where neuroimaging evidence is used since its historic introduction in the Weinstein case. Duke law professor Nita Farahany has been keeping count of cases where lawyers have introduced neuroscientific evidence since 2004. She has documented about 2,000 examples, 600 in 2011 alone. 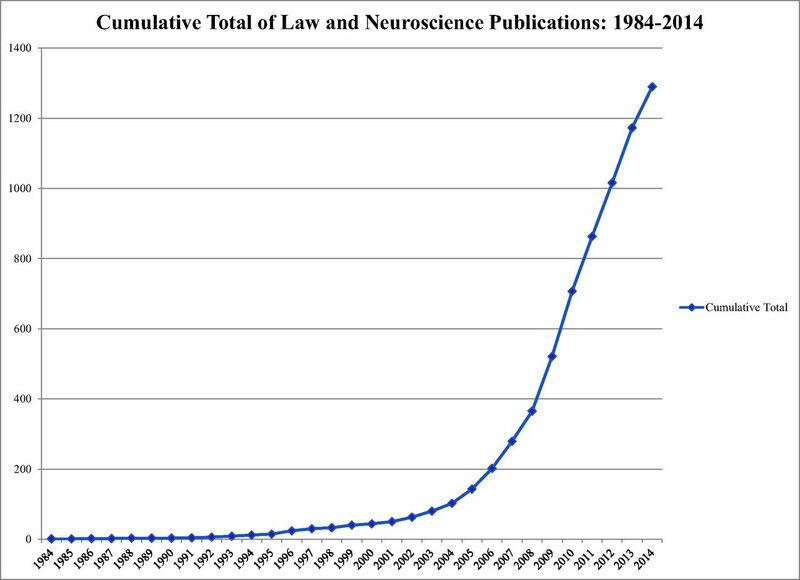 The number of publications involving law and neuroscience interaction has skyrocketed in the past decade (Fig. 1). Reproduced with permission from The MacArthur Foundation Research Network on Law and Neuroscience, Law and Neuroscience Bibliography, available at http://www.lawneuro.org/. The above statistics raise a few questions: Has neuroscience become so relevant to legal proceedings that it can inform the legal system in a meaningful way to resolve some of the most complex matters such as free will and determinism, the neural seat of morality, and prediction of future risk? Can neuroscientists say with reasonable certainty that the science they intend to sell to the legal community will help them in a more meaningful way than the traditional science involving behavioral and psychosocial research? Is the legal community ready and capable of integrating this modern neuroscience into their practice? Answers to these questions are as complex as the questions themselves. Neuroimaging advances have helped to further our understanding of brain development through childhood and adolescent periods of life. These newly gained insights into developmental neuroscience played a crucial role in Roper v. Simmons6 and Graham v. Florida.7 Numerous amicus briefs were sent to the U.S. Supreme Court in both these cases. These briefs cited neuroscientific findings relevant to the legal question: are capital punishment and life in prison without parole (for nonhomicide offenses in the later case) cruel and unusual punishment for juveniles? The neuroscientific evidence here was quite relevant. Most important, it played a crucial and visible role. The neuroscientific evidence submitted was gathered from research on a large group of subjects and applied to a single particular case, in contrast to the use of an MRI or PET scan of an individual during his trial. How far have we come since People v. Weinstein with the use of brain imaging (structural and functional) evidence to palpate the heartbeat of the trial: namely, whether the defendant knew right from wrong or was capable of conforming his actions according to the requirements of the law? The answer, unfortunately, is not very far. Whereas neuroimaging research has been central in revealing the deep-seated mysteries of the brain, these revelations have not shed much light on the areas of free will, morality, and behavioral responses to environmental stimuli. The activation of a brain region on functional imaging such as the PET scan does not mean that the activated brain region correlates with a specific behavior. A single area of the brain may be two or three different areas working simultaneously. In fact, one of the fascinating findings of modern neuroscience research has been the discovery that the brain is an organ that is operational through parallel circuitry in different regions and that these circuits are interconnected. Despite this reality, this type of evidence is increasingly admitted into the court and used at trial.8 It is the responsibility of neuroscientists to separate the wheat from the chaff when testifying.9 They can play a vital role in making sure that overreduction of the neuroscientific evidence does not occur. More specifically, they should explain the limitations of applying group-based evidence to a single individual. Admissibility of expert opinions is guided by rules of evidence, as we all know. However, it is my experience and that of many of my colleagues that neuroscientific testimony is often misrepresented or poorly analyzed. Well-trained and experienced neuroscientists serving as expert witnesses can provide to the court much-needed guidance and knowledge to wade through often murky waters of neuroscientific testimony given by less qualified or inexperienced witnesses. Nuanced testimony is often required to explain finer aspects of different brain imaging techniques to the judge and the jury. For example, it is essential for them to understand how the fMRI images are acquired and what they represent. More specifically, they need to know that fMRI images do not constitute a one-on-one correlation between a brain region and behavior, but are rather statistically determined images. A neuroscience expert then can explain that some correlation can be made between that region of the brain and the functional/behavioral paradigm that was used to measure the activity of that part of the brain. Moriarty et al.10 cogently discussed the evidentiary reliability and causation when using PET scans as evidence. PET scans can be reliable to demonstrate actual brain damage, due to traumatic brain injury, hypoxic–ischemic damage, brain tumor, or congenital brain trauma, for example. However, using the same PET scan to offer a behavioral explanation for a particular criminal behavior could be too much of a stretch in many cases. Moriarty et al. call this “piling inference (e.g., the PET can reliably diagnose brain trauma) upon inference (i.e., brain trauma is the cause of legally relevant behaviors) (Ref. 10, p 710).” Evidence contained in an abnormal PET scan must be offered in conjunction with a detailed neurological and neuropsychological examination documenting the neurological and neurocognitive abnormalities. When available, an abnormal structural brain imaging scan (computed tomography (CT) or magnetic resonance imaging (MRI)) can provide the third element of what can be called reliable neuroscientific evidence (clinical examination, structural brain imaging, and functional brain imaging). There are several legal scenarios where neuroimaging evidence may be relevant to the legal question and can contribute a great deal toward achieving a resolution of legal matters. For example, neuroimaging findings of mild cortical atrophy in a young person with a history of perinatal hypoxia may help in substantiating the claim of permanent disability due to cognitive impairments that were shown to be evident on neuropsychological testing. Such evidence would prove to be valuable to the lawyer in helping a client with a disability claim. Often routine brain imaging such as MRI is not revealing in this case. Use of novel neuroimaging methods such as DTI may become helpful in these cases by showing the evidence of white matter demyelination. Proving a claim with the help of sound neuroscientific evidence may open the door to opportunity for a client by getting proper accommodation at work or school. Diagnosis and management of epilepsy have benefited significantly from advanced neuroimaging and neurophysiological techniques. Localization of epileptic focus with precision, detection of congenital cortical malformations (hamartomas), and surgical planning for removal of epileptic foci are some of the benefits of these newer investigative methods. Some patients misdiagnosed with pseudoseizures (nonepileptic events) now have a diagnosed epileptic condition, making it possible for them to get proper treatment, patient advocacy, workplace accommodation, and disability when indicated. Newer imaging modalities (such as magnetoencephalography) have made many epileptic conditions surgically remediable with precise localization of epileptic focus and functional brain mapping.11 Not using these techniques during an epilepsy workup may lead to successful malpractice claims against clinicians. On the other hand, I have seen patients who malinger seizure disorders for primary gain. Aforementioned techniques along with video-electroencephalogram monitoring have helped to rule out the diagnosis of seizure disorder with far more certainty in those cases. The diagnosis of epilepsy has been used as an affirmative defense in criminal cases from time to time. A few years ago, I consulted on a patient who was charged with breaking and entering his neighbor's house at midnight. The patient was brought to the hospital for evaluation because he was confused. After an extensive workup, a diagnosis was made of frontal lobe seizures, and the charges were dropped. Humans have always been curious to know what their fellow humans are thinking. A variety of techniques have been used since ancient times, such as pulse measuring by Greeks, harsher techniques in the Middle Ages, and the polygraph in the 20th century.14 Modern neuroscience has introduced newer techniques, such as electroencephalogram (EEG) and fMRI to read minds, and more specifically, to detect lies. Review of techniques for lie detection is beyond the scope of this editorial. I will highlight the arguments favoring and disapproving of their use by forensic practitioners. United States v. Semrau15 provides an interesting reading of the court's decision to exclude fMRI-based lie detection testimony after conducting a Daubert evidentiary hearing. The court granted the prosecution's motion to exclude such testimony, finding that the fMRI lie detection technique was young and immature, did not have real-life error rates, and was not generally accepted by the scientific community and that the prejudicial value outweighed the probative value. Wagner25 concluded after his meta-analysis of 28 peer-reviewed articles that the available data are insufficient to show the sensitivity and specificity of fMRI-based lie detection. Jones et al.14 describe two cases from India (Maharashtra v. Sharma and Khandelwal and Selvi v. Karnataka) in which brain-based lie detection evidence was considered by the court. The first case involved a murder trial. In the second case, the Supreme Court of India examined the coercive administration of brain-based mind-reading techniques (polygraph, narcoanalysis, and brain electrical activation profile (BEAP)) by law enforcement to obtain information from terrorists and other criminals. The court ruled that no individual should be forcibly subjected to any of the techniques in question. Where do we stand in regard to using the brain-based lie detection techniques in general and fMRI-based lie detection in particular to solve legal questions? Justice Clarence Thomas14 stated that the fundamental premise of our criminal system is that the jury is the lie detector. Moriarty16 argued that an informal evidentiary moratorium be put on the admission of this evidence until the science is further developed (to fulfill the Daubert criteria). Appelbaum17 expressed concern regarding the intrusive nature of such techniques. Greely and Illes18 advocated for federal regulation of lie detection techniques, including U.S. Food and Drug Administration (FDA) regulation of the safety and efficacy of the machines. Other legal scholars have raised concerns regarding encroachment on an individual's constitutional rights, such as the privilege to avoid self-incrimination and the right to trial by a jury. On the science side of the equation, lie detection techniques face a big challenge regarding ecological validity. How realistic are they for the real world? How do you extrapolate from the lab findings of lie detection to real-world lie detection? There is a consensus in the scientific community that fMRI-based lie detection is not yet ready for the courtroom. Genetics research is another rapidly expanding area of human biological sciences. Neurogenetics research has focused on establishing a link between the genetic, environmental and psychological states, including various human behaviors. Farahany has written extensively (Farahany and Bernet19 and Farahany20) on the topic of human behavioral genetics in criminal cases. Genetics testimony has been used in criminal cases by the defense to support the diagnosis of a particular mental disorder (depression or schizophrenia for example) in the defendant. In State v. Davis,21 the defendant's family history of mental illness was used to support the defense that the defendant had severe depression (mental illness), and, therefore, he could not possess the requisite intent to commit first-degree murder. The jury rejected this claim, and the verdict was affirmed on appeal.21 Courts have generally not allowed such testimony to be presented at trial to raise an insanity defense. This type of testimony is used mostly to mitigate the sentencing. As in most other areas of neuroscience, neurogenetics will continue to advance. With the identification of more genes and learning about their interactions with specific environments, their roles in particular human behaviors will become more apparent. This knowledge will then undoubtedly be used by defendants during trial as mitigating evidence, to deny culpability and to assert an insanity defense, among other possibilities. Farahany20 cautions about behavioral genetics evidence being a double-edged sword for defendants. The courts may adversely interpret the testimony, or the prosecutor may use the testimony to convince the jury to incarcerate a person predisposed to high risk of violence instead of setting him loose on the street. This discussion on a select few areas of neuroscience in the legal context gives us a reasonable insight into the current state of the marriage between the two. Jones et al.22 described them as strange bedfellows that were inevitably destined to engage. Neuroscientists will continue to investigate and innovate. Lawyers will continue to advocate for their clients and society. There will be supporters and protestors of this as yet uneasy alliance. Fortunately, there is a movement on both sides to foster collaborative relationships. Neuroscience has a role to play, by informing the legal system of the usefulness and limitations of newly gained knowledge and by helping the legal system make legally and scientifically sound inferences about relationships between the neuroscientific evidence and particular behaviors.22 Farahany20 encouraged more nuanced dialogue between neuroscientists, legal decision-makers, and the public. She points out the efforts of several national and international organizations (the John D. and Catherine T. MacArthur Foundation, the Dana Foundation, and The Royal Society of London) to educate the public in this regard. Morse23 provided a compelling dissenting argument to the views advanced herein. He stated that he worries about potential abuse of science in the courtroom. He argued that our law is based on folk psychology and a normative value system. Several terms coined by Morse help us understand his healthy skepticism and abundance of caution: neuroexuberance, brain overclaim syndrome, and cognitive jurotherapy. He remains hawkish on his long-held belief that modern neuroscience has not much to contribute to legal policy and doctrine. He is cautiously optimistic about the potential of neuroscience to make meaningful contributions to the law.24 I am personally encouraged by his assertion that modern neuroscience will not replace the essential role of forensic psychiatrists and psychologists. Neuroscience can contribute greatly to the forensic practice. Neuroscientists and clinicians should take a visible role in informing the legal community and the public of newly gained insights into brain functioning. They must speak out loudly against the misuse of neuroscience in the courtroom. Neuroscientific evidence alone should not be offered to assert the inability to form the requisite intent to commit the crime. People v. Weinstein, 591 N.Y.S.2d 715 (N.Y. Sup. Ct. 1992). Graham v. Florida, 130 S. Ct. 2011 (2010). Unites States v. Semrau, No. 2:10-cr-10074-JPM (W.D. Tenn. 2011). State v. Davis, 2001 Tenn. Crim. App. LEXIS 341 (Tenn. Crim. App. 2001).